Partnering with top global pharmaceutical companies, we push the boundaries to create meaningful, impactful and lasting learning opportunities. We leverage our creativity, passion, and expertise to produce customizable medical and scientific communication services that are tailored to your specific objectives. With over a decade of experience in medical communication, we have a deep understanding of the challenges unique to your industry and stakeholders. We work in close partnership with your team to create engaging content and compelling programmes that deliver measurable results and uniquely communicate your story. With offices in North America and the UK, our expertise has been sought after in 34 countries around the world in over 40 therapeutic areas. Visit us online at www.sixdegreesmed.com to learn more about us! 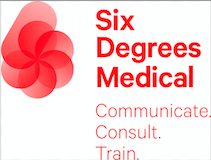 "The Six Degrees Medical Consulting Team has the creativity, experience, industry knowledge and professional attitude that I need for flawless execution of world-class projects, meetings and events. I can always trust Six Degrees Medical to deliver, even when I give them impossible deadlines and truly complex, content-heavy projects." "Six Degrees Medical Consulting is able to provide high quality and effective medical writing expertise. They have not only provided medical content writing but have also demonstrated strong design and document management capabilities. We have partners with Six degrees Medical Consulting to develop slide decks, instructional guides and associated program documents. From the strong work demonstrated, we will be engaging Six Degrees Medical for future projects"